In 2016, we invited students from the Middle Years Programme (MYP), Diploma Programme (DP) and Career-related Programme (CP) to take part in the Academic Honesty Competition. Students were asked to submit a poster or short film either individually or as part of a team. The results were outstanding and the standard of films and posters was exceptional. Choosing the winners was a very difficult task for our panel of judges but we are delighted to share with you the winning entries along with an interview with those winners. A huge thank you to all those students who participated in this competition with such enthusiasm. 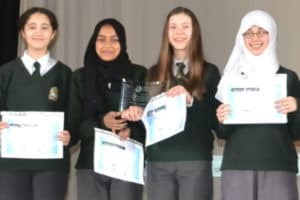 We spoke to four students Hanna Jean, Hind Melouah, Leena Aissaka and Madina Khaleque, MYP students from the King Fahad Academy (United Kingdom), and winners of the MYP film category, to see what they thought about winning and why they felt academic honesty was an important topic. Why did you decide to take part in this competition? Hanna: I wanted to express my ideas and opinions about academic honesty. Hind: I wanted to use this opportunity to use my creativity and skills to create a good piece of work and to present to other people the importance of academic honesty. Madina: I wanted to give my opinions and thoughts about academic honesty. Leena: I didn’t want this chance to pass me by. I found it quite interesting. Did you already have an understanding of what academic honesty means? Hanna: Yes, we all had an understanding of academic honesty. How did you decide whether to make a film or create a poster? Leena: We decided together as a group and had an idea to make both, just in case we lose in one and win in the other. Why do you think academic honesty is important? Madina: Academic honesty is important because it gives students information on why it is wrong to copy other people’s work and encourages students to work on their own. Hind: It helps students to learn to work independently. Leena: Yes, I think creativity can be a very important skill. Hind: Yes, I enjoy being creativity especially through art. Which part of your MYP studies do you most enjoy? Hind: I enjoy art, mathematics, languages, physical education and design technology. Madina: I enjoy many parts of my MYP studies. Hanna: I enjoy science, mathematics, English, Arabic, art and drama. Leena: I don’t really have a favourite! I enjoy most of my studies but for me it depends on the type of unit. I only like some types of topics. For example, I mostly enjoy algebra in mathematics. In science, I enjoy biology and chemistry more than physics. I also enjoy more physical subjects. How did your teachers / parents react when you told them you had won? Hind: They were very happy and proud of this great achievement. Madina: They were very pleased and proud. Hanna: They were super proud of us and very happy. Leena: My teachers and parents were very happy. To be honest, my parents and I were surprised because we won when we were [up] against many schools! My teachers and parents were very, very happy and their happiness could not be explained because this was really a great achievement and I am very proud. What do you feel you have learned from this experience? Leena: I have learnt many new things and most importantly, I’ve learnt how a team should work and how decision should be made when you are in a team. I think I’ve improved my teamwork skills. I’ve also learnt how to achieve your goal by the time limit and how to be well-organized. Hind: I have learnt more about academic honesty and improved my creativity, communication and collaboration skills. Madina: I have learnt a lot about academic honesty in general. Hanna: From this experience, I have learnt that team work makes a dram work and that if I was to do this alone it would have taken ten times longer and would not have been half as good. I have strengthened my belief in academic honesty and that cheating will get you nowhere in life. Hard work, concentration, dedication and understanding will help you succeed. I also learnt that listening to people’s ideas is key. That’s why there is no ‘I’ in ‘TEAM’. Tech buffs to the rescue!